Tom Baker installs a new bike rack Friday. Tom Baker was looking for a way to “do his part.” The Bremerton man, who works in the city’s public works department, has become an avid cyclist. After completing the Tour de Kitsap and Seattle to Portland bike rides, he felt he had to chip into the local cycle community. 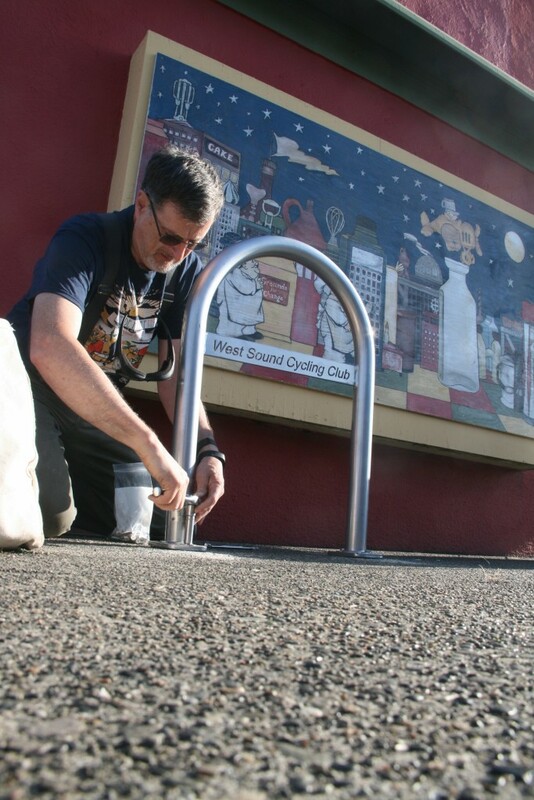 He joined West Sound Cycling Club, became its secretary, and now is helping to install 13 new bike racks around Bremerton and Kitsap County. On Friday morning, he bolted a new rack near Hi-Lo’s 15th Street Cafe in Bremerton. The racks are important, he says, to give bicyclists confidence at their destinations. “You want to feel your bike is secure,” he said. As the city of Bremerton constructs more bike lanes in the city, including as part of its Lower Wheaton Way and Washington Avenue projects, more racks will be needed to accommodate the additional two-wheeled riders. After installing a few outside Silverdale Cyclery, the group now has nine racks left to put in, in spots anywhere from Gig Harbor to Hansville. If you have questions about the new racks, email Baker at tombaker070@gmail.com.